As a writer, I love words. I love coming up with new and exciting ways to phrase things, so it should come as no surprise that I love the idea behind the board game Taboo, a game for adults that challenges players to describe a word WITHOUT using certain words. To succeed at this game, you really have to get creative, and I do love a challenge! 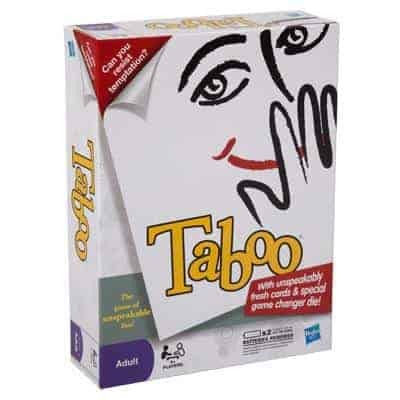 Taboo is a fast paced game for 4 or more players, and is perfect for parties. You can split players into two teams, and it actually doesn’t matter if the teams have unequal numbers of players, which is a point in its favor! A member of Team A chooses a card and gives clues to the rest of his or team, while Team B sits behind the “clue giver” and watches for any “taboo” words to be said. If they are, then someone presses the buzzer, which says “nah uh”, and then it’s Team B’s turn to give clues. For every word guessed correctly, the team is awarded one point. No sound effects, gestures, abbreviations, or rhyming words can be used as clues. But you better guess the word quickly, before the timer runs out! Keep guessing them right, and keep getting more opportunities to rack up points for your team. One Guesser This means that whoever is acting as the “clue giver” will pick only ONE player to guess on that teams turn. Double the Time Instead of one timer cycle, your team actually gets two! Statue While giving out clues, the “clue giver” cannot move at all. Someone else will actually be holding any cards in play! Crazy, right?? All Play Look out!! Both teams can guess for the clues. Classic Play Follow only the classic Taboo rules for this turn. I am LOVING this new edition of Taboo, and so will you! The next time that you and your friends get together for an evening, you should definitely consider coaxing everyone into playing. See how creative you can get in trying to describe words like “divining rod” without using these words: “forked”, “stick”, “underground”, “water”, or “point”. I’d hate to draw that card for my turn as “clue giver”, wouldn’t you?